Learn how to create a realistic antique effect. Adobe has released two new video tutorials to help you take your Photoshop Creative Cloud skills to the next level, and create painterly effects using its range of Edvard Munch paintbrushes (download your brushes for free here). In the first tutorial, Photoshop expert Kyle T. Webster shows you how to use the Mixer brush tool to add life to simple shapes. This tool enables you to paint with more than one colour in a single stroke, blending shades as you go. With a little guidance you can build up your brushstrokes to create a textured impasto effect in your digital paintings. Watch the tutorial below. The second tutorial shows you how to use Adobe Stock to add some context to your digital painting. You’ll learn how to use stock imagery to put your design in a frame, and add textures to create an antique, cracked effect. 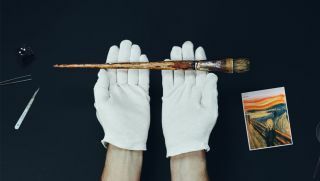 The tutorials are part of Adobe’s Hidden Treasures of Creativity project, for which it transformed the centuries-old paintbrushes used by Edvard Munch into a set of free Photoshop brushes.